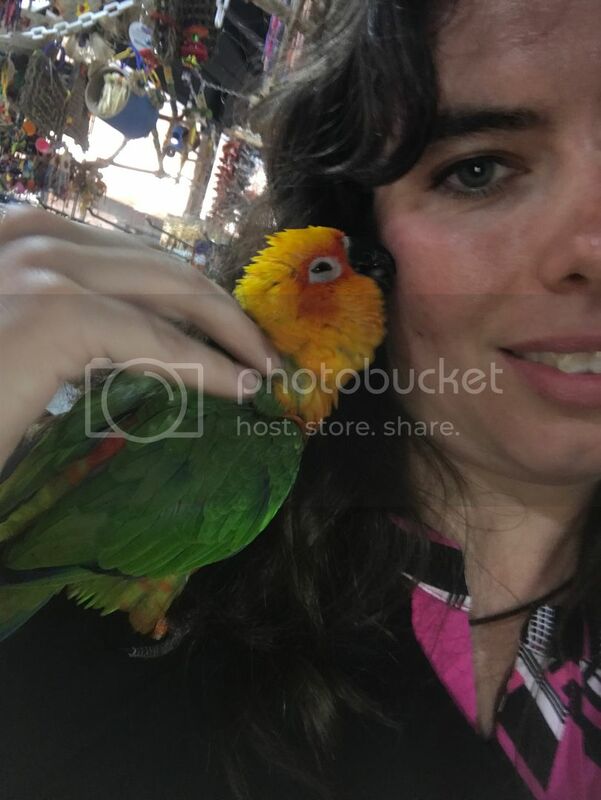 Pictures Jenday conure owner experiences? 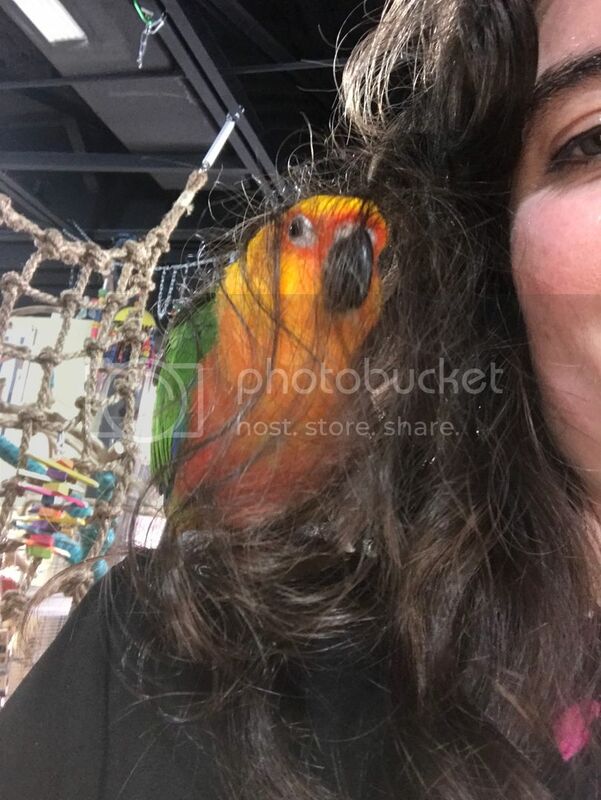 Discussion in 'Conure Court' started by BeanieofJustice, 4/15/19 at 6:12 AM. BeanieofJustice Rollerblading along the road Mayor of the Avenue Avenue Veteran I Can't Stop Posting! 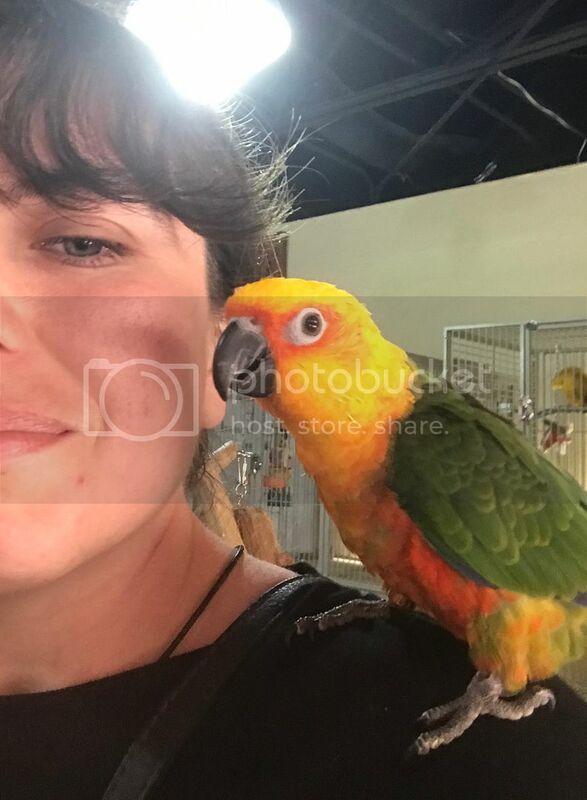 I first met this particular bird when visiting the bird store, my bf pulled him out and when the worker warned him that the Jenday bit, he went to put him back. Me being me, had to see if the little bird wanted more time out and he hoped out. He didn't bite me, he just hung out. He was covered with pinnies so I could bet that was part of why he was so grouchy. I'm conflicted, he's been there for quite some time, and because he bites, I don't know how keen people are on him. I am a big proponent of rescuing and not buying a baby but, we click. He's a bit grumpy and has lots of pinnies but, he seems to like me. I've spoken with the family that owns the small shop (it's family owned, not a chain) and they seem keen to have the birds go to the right homes rather than just making money. They were surprised that he stayed with me because usually he flies to the owner of the store's daughter. They know the breeders that their birds come from personally. They also use my same vet, which I thought was pretty cool. Last time I went, he called to me, and after he came out, he perched on my shoulder, napped, stretched and preened. He even let me get a few pinnies. I think he's the sweetest thing. I make a point of stopping by to see him and let him out. He has more of an opinion than the other young birds that I've met, and I thought that was pretty cool, he's also a bit older than the other ones, albeit I don't think by much. He is fully weaned. Sorry I'm always so darn long-winded! So, I was curious, since there isn't a Good, Bad and Ugly about Jendays, I figured ask about other people's experiences. As promised; here are some pictures. I didn't take pictures of every visit, and I dislike selfies but he's cute, so such is life. Kodigirl210, Eloy, faislaq and 1 other person like this. Oh My Gosh love love him!!! Our Aries was a Jenday and my total heart bird, I miss her so much. 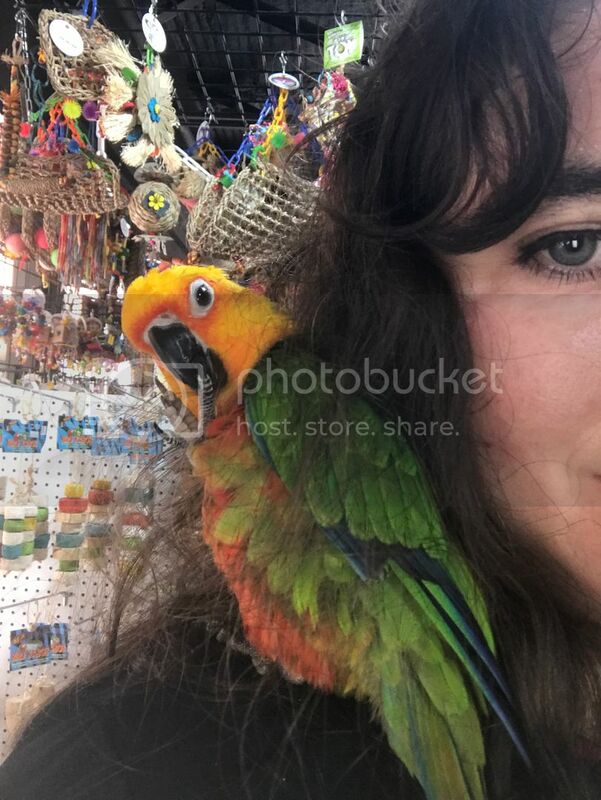 She was a pet shop bird too but one that everyone was scared of so she never got out and had been returned to the store at least twice that we knew of. She had a very rough start and took a long time to trust but once she did she was the most loving little girl. Her call was very loud which I think is why she may have been returned but over all noise was pretty low really. She never bit me to the point of drawing blood either even though the store wore bite gloves anytime they entered her cage. She took a long time to warm up to things like toys but once she did look out that toy was dust. If there are any specifics you want to know just shout. Eloy, faislaq and BeanieofJustice like this. Oh wow!! That sounds just like this little boy. Is she the Jenday in your avatar? She’s beautiful! I can’t think of any specifics at the moment, I know birds are individuals but was she happy to play independently? What were her favorite toys? Could her beak crunch up those little bells? Was there anything about her that surprised you? I really like my Jenday. He doesn't like to be scratched but he doesn't try to bite me and I'm working on touching for treats. He is very very good about stepping up and going into various carriers, outside into the aviary, and on different playstands. He is not aggressive to other birds but some (Hahns, just how he is) are to him so we separate. He is 24 and had spent 12 of those years at The Gabriel Foundation rescue. I adopted him last year and his mate had died about 6 months before that. His name was Squawker and I changed it to Walker. His call is indeed loud but he doesn't do it often and it is usually in concert with the rest of the flock yelling at something. I love the way he makes eye contact with me and really seems to be thinking about things. Looking at those pictures....that little guy really does like you. I have been hoping he'd find a home with you. Lady Jane, Eloy, faislaq and 1 other person like this. BeanieofJustice, Eloy and faislaq like this. I dislike selfies but he's cute, so such is life. He's adorable, you were right to throw caution to the wind and post selfies with him! He's quite a matter of disguise. He's so well hidden that I don't even see him in two pics of that last set. What will Sam Axe think of having a little brother? BeanieofJustice and Eloy like this. Why are he still at that store? Lady Jane, faislaq and BeanieofJustice like this. Aww, poor bubby, I'm glad he found a home with you! That's something I noticed about this guy to - he seems very deliberate, he doesn't just step up for anyone. There's something there, I've heard him call (right next to my ear, lol) but that's usually in chorus with the other birds around. I adore this little boy. And thank you, that means a lot. I am leaning towards bringing him home - even my mother was surprised that I didn't have him in my home yet. He actually was with many different birds when I got him, I think it would help him with his trust; seeing another bird handle things that he's afraid of. 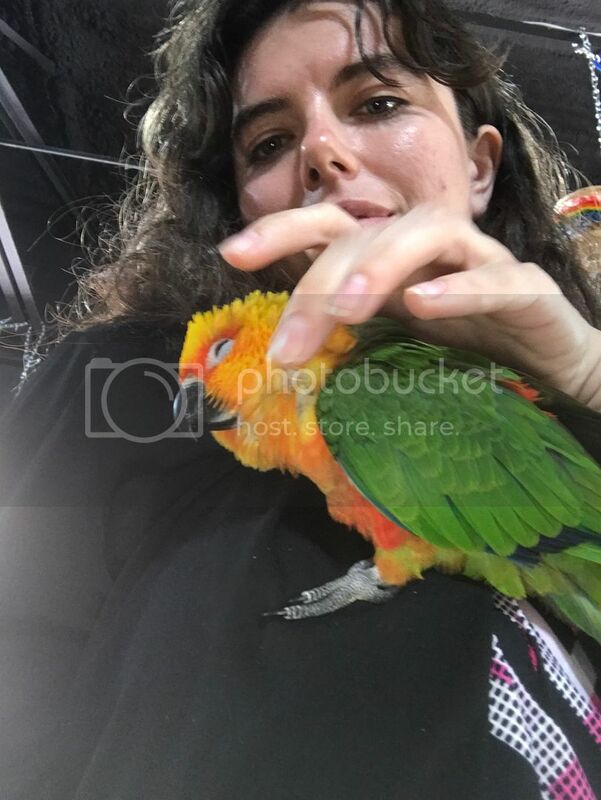 Originally, I took him home with a second bird (female Eclectus) but she was her previous owner's heartbird and the woman missed her so much she asked for her back. He didn't mind living with her, he ignored her for the most part. I would also like that he'll have company while I'm away at work - flocks are important. I felt better when I asked my vet and he told me that Sam Axe was fine and healthy, and the vet he seems to like the owners of the shop. They are holding him for me - I wanted to think about it (now they aren't open until Thursday). I found a cage on sale (like a hundred dollars off) that color matched Sam's (HQ Flight Cage) so I bought it a few months ago. Some of it is Sam Axe's ignored toys and perches, I've ordered perches that didn't seem big enough for him in the past but kept them. I have the finances and the resources for a smaller bird. Honestly, I didn't expect to meet or bring home a bird for some time. I've also removed the smallest perch on the bottom door - I got it from eBay and something about it felt off so I got rid of it, I think it was way too small anyway. Eloy, faislaq and MommyBird like this. Yep that is her in my avatar. She would play independently but she was also a cuddle bug and would just be content to sit on our laps all fluffed up wanting scratches. She was a bell-a-holic bells were by far her favorite toys to play with. She loved her bells but some of the smaller ones she could rip apart no problem. We got her several of the stainless steel bells that were more durable to keep in her cage and she only got the smaller ones as out of cage toys. She also liked most of the wood toys from vendors on the forum. She did not like other birds at all. Even bird sounds on the tv would send her into screaming sometimes. It did take me a bit to get her converted to a pellet diet and to get her to like veggies. She was a great little girl and we were so lucky to have had her for even the short time that we did. The first time she ran across the bed to get to me was probably the biggest surprise that we had. Even though she was not ready to be touched we let her out all the time and just used a perch to get her back in her cage while we were working on trust. When she ran at me across the bed I didn't know what to think but that was the point she decided I was an ok flock mate. Awww, yeah, Sam Axe LOVES bells but he can't have any unless they're the stainless steel ones because he rips the clacker right out--happened once, I nearly had a heart attack and I managed to trade an almond for the clacker. I was curious if their little beaks were pretty much the same. And awww that she ran to you sounds amazing! She sounds like she was an amazing little girl. I love the toys from the vendors, if I don't make them myself. I do have to give the shop credit, all of their birds eat pellets and veggies. Was Aries around birds at the shop? Did she similarly dislike them if she was? I really appreciate you answering my questions! and he just loves to hide in his Jellyfish from Oliver's Garden. It cracks me up. He also likes the Alien Lots of Legs from TNT toys. I'm so glad to hear they are holding him for you! faislaq and BeanieofJustice like this. Awww - I'll have to try those toys! That sounds adorable and funny. And thank you, I'm glad that they're holding him, after this last time I realized how sad I would be if he wasn't there... I had to do something. faislaq and MommyBird like this. They had her in one of those plexi glass bird cages that are split and in the other side was a GCC. We were going to buy them both because I thought they were in the cage together, I didn't notice the divider. The store told me that she didn't like other birds when I asked about the GCC too so we just got her. The rest of the birds in the store are in a different sections of the store but the little GCC she would lunge at. Maybe with time she would have warmed up to some birdie. Oof - yeah, I've seen those kinds of cages, more than once I thought birds were together that weren't. And if it looked like they were in her space, I can't blame her. This guy is around the other birds there, they have a whole play area, so he's still young but he doesn't seem to mind other birds. faislaq and Teckechick like this. Thank you, lol, he is, isn't he? No bright birds there! Just hair! faislaq and Kodigirl210 like this. Teckechick, Eloy, faislaq and 1 other person like this. Awwwww!! What a great picture! So cute! Teckechick, faislaq and MommyBird like this. Some more pictures with him. I just adore this guy - I've been checking their website for three weeks to see if he'd been sold. Dreading that. Edit; My weird expression was due to me fiddling with my phone. I'm not very good with it. Teckechick, Eloy and faislaq like this. I might just go get him on Thursday... I've even been thinking of names. Donna turner, Teckechick, Eloy and 2 others like this. 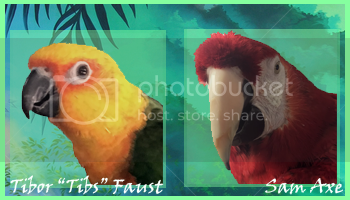 Teckechick, faislaq and BeanieofJustice like this.